Today I got the rest of our winter gear all washed during mid-peak hydro hours. It air-dried outside lickety split quick in the sun and is all packed away in bins (coats, scarves, hats and mitts) or donation bags (kids boots and snowpants that will won’t fit next fall) and there are no drying racks in the living room. Bliss! Tomorrow is whites and ironing. 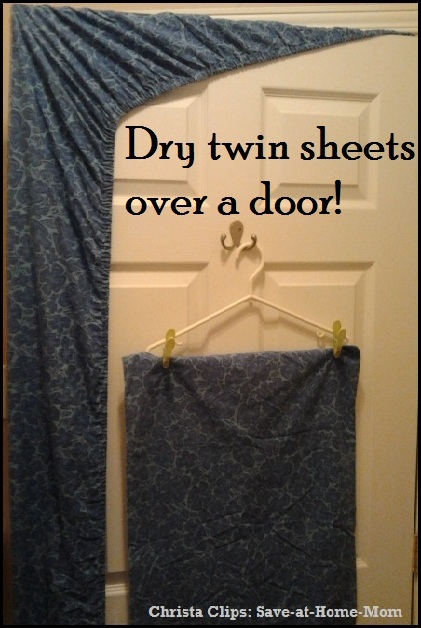 I’m rocking this whole 5 Day Dryer-free Challenge! Phew! Full marks today on getting the kids beds laundered and made up again before they got home from school. Even on these damp days, the sheets only take a couple of hours to dry draped over 2nd floor doors and I didn’t spend any extra time folding them … just straight back on the bed! Tip: paint the top of your doors with high gloss kitchen or bathroom interior paint so that they’re easy to clean and won’t snag fabrics. As expected, the load of towels didn’t dry completely on the dryer rack placed over a heater vent. The sun finally peeked thru at about 5:00 tonight and the patio door area got quite hot … if only we’d had another hour of sun, I’m sure they would have dried completely and I could have gotten them put away by bedtime as hoped. Instead, I carried the whole rack down to the basement and will fold them tomorrow morning. Towels are especially susceptible to going musty or having that rotten wet dog smell (you all know what I’m talking about, right?!) if they’re put into the linen closet with even the slightest amount of dampness, so I don’t take chances. Getting everything done in the 5 day work week is looking more and more like a possible goal, especially considering that most of tomorrow’s items are already done. If it were to rain all week long though, I could see running into problems with jeans, outerwear, towels and blankets. This condensed schedule (i.e. laundryless weekend) relies on the dryer racks being empty and available by 11:30 each morning. I can actually imagine myself becoming a solar slave: “so sorry, I can’t make it out today … It’s sunny and I’ve got to get the jeans hung out.” Hmmmm, worth the $1000 savings from not replacing our broken dryer? Time will tell. Tomorrow – winter gear washed, air dried and packed away until fall. Rain. Drats. Nonetheless, I’m proceeding with my 5 Day Dryer Free Challenge and today’s goal is to get 1 full load of towels washed and hung to air dry as well as 1 load with both of the kids bedsheets. The sheets will dry over their bedroom doors in just a few hours (I’ve been doing that all winter) and I’ll have their beds made up by the time they get off the school bus at 4. I’m not confident that the towels will dry in less than 12 hours, though, and I’ll likely end up with the dryer rack in the basement overnight. 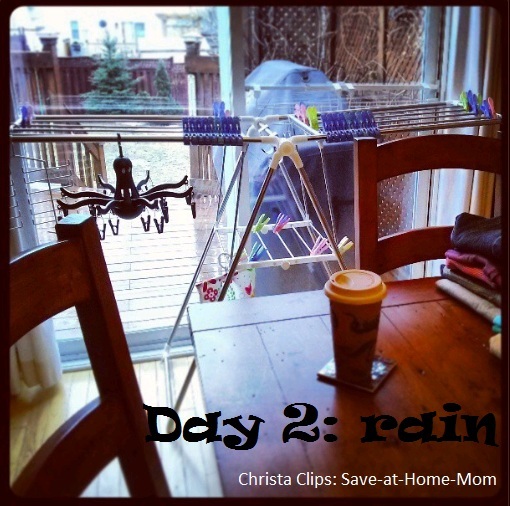 (I failed on that task yesterday … read about it in Day 1: Diary of a Dryerless Dame!) This morning I got the towels into the washing machine right at 9 to soak and will start the cycle (shortest possible) as soon as the hydro rates drop at 11am: pre-soaking for a couple of hours really does make it possible to use those ultra short cycles on your machine. 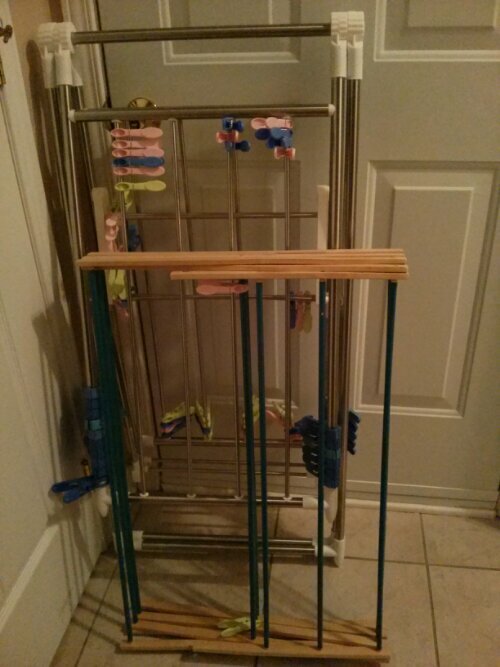 I’ve got my full arsenal of dryer racks and clips ready to go over the heat vent infront of the patio doors. It doesn’t look like I’ll have any sun-power to help today, and normally I’d just postpone to another day, but I’m determined to get everything done and put away by the end of the work (from home) week on Friday evening and free up my weekend.